Exhausted, sweating, lungs-burning we crashed at a semi-flat area beside the stream. This was as good a place as any to make camp. The forest here was excellent: tall trees shaded the area creating a dappled play of light and shadow. I was glad to be back into the jungle. At the same time I was dismayed that we had so little time. I tried not to let this get me down. As the others began making camp I wandered around the area looking for firewood—and the odd leech. While doing so I reasoned to myself that some time is better than none at all. But we would have to work hard to make the precious hours count. After camp was completed and our hammocks strung I announced that we would leave an hour early every morning and work an hour later. The Forest Guards readily agreed. This lifted my spirits. I was again reminded of the dedication and professionalism of this group of individuals. It was an honor to work with them. I reflected that night, as we finished dinner and passed around the communal bowl of rice wine, how fortunate I was to have fallen in with this group. The trip would be short, yes, but our team would do everything we could to make it a success. Only one factor now could ruin our trip: the torrential and always unpredictable monsoon rains. But the weather held. In fact, other than a few light drizzles it was bright and sunny the entire time. I don’t believe in Fate, but some part of me wondered if this was recompense for surviving the horrendous field conditions that we endured in the ill-fated Bach Ma expedition. The jungle was still tough, no doubt about that, but when it was dry it made work at times almost pleasant. We could climb through the forest rather than sliding up and down slippery slopes. The dryness made it more difficult to pick up sign but we still saw abundant ungulate tracks. Over the course of the next several days we came across wild pig, muntjac, sambar, and serow footprints. The animals were there. And best of all: we were collecting good leech numbers. At some point I feel that this is simply a numbers game. 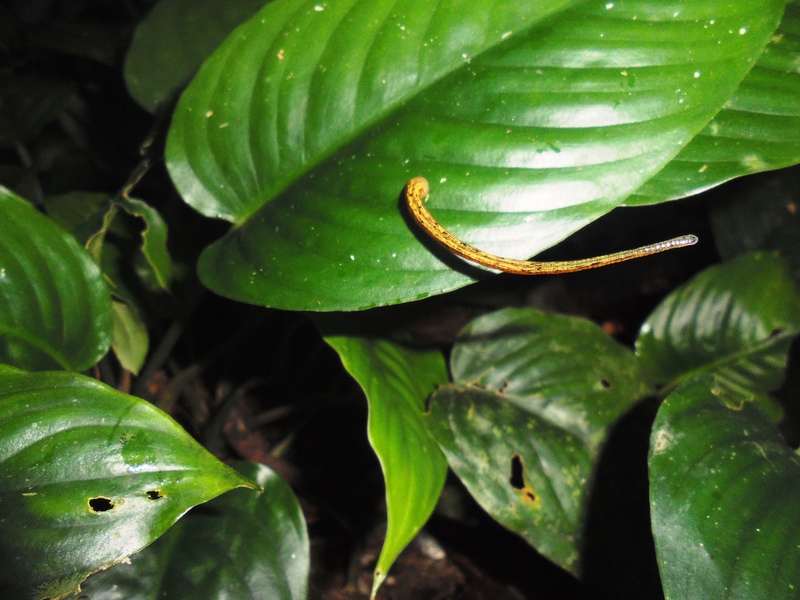 If you want to detect rare species you’re going to need a lot of leeches. And we were making headway on that front. My team was averaging close to three hundred leeches per day. The second team, led by Hung, was getting up to five hundred. With these numbers I believe it likely that we will find some of the rare ungulates that live in this region. We’ll know in the next several months. Our time quickly drew to a close. I was genuinely sad to leave this patch of pristine forest. The optimistic glimpse I had gotten the week before had proven to be spot on: we were in a wildlife hotspot. I must admit, however, that I was also glad to get back to civilization—and medical attention. I had developed festering sores on my feet that made walking, much less hiking up and down steep mountains, difficult and painful. Seasoned tropical field biologists had told me about the horrors of “trench foot” but so far I had escaped this unpleasant condition. Now I have firsthand experience. And for the record it’s one that I would rather not have had. In fact, it got so painful that I don’t think I could have physically worked in the jungle much longer. Every step was a teeth-gritting wincing ordeal. Pain medications kept me hobbling along looking for leeches the last couple days but by the final afternoon I’d had it. In Spades. As I limped out of the forest on the last morning I reflected that perhaps this trip had worked out for the best after all. Good weather, productive results given the short time we had to work with, and an auspicious timing for our exit (at least from my perspective.) Most importantly: we had finished the expedition strong. It had gotten off to a rocky start. But we had taken the challenges in stride and come out on top.